As you may have noticed, we had some snow this week. To accommodate winter storm “Juno,” the Town Council Meeting was rescheduled and the location has been moved! The location was changed to the High School to hopefully encourage people to attend this meeting and voice their opinions on full-day Kindergarten. Dr. Auger sent out an email specifically encouraging parents to attend this meeting. We are encouraging people to attend this meeting so the full-day K will stay on track and not get delayed. We will likely need parents to attend again in April. Thanks for your participation! At this January 26th meeting, the School Committee will discuss the budget and full-day K with the Town Council. The recent survey shows overwhelming support for full day K (over 90%)! Our understanding is that the community, the Superintendent, and the School Committee support the implementation of full-day K starting in the 2015-2016 school year. If we can get 50 people to attend this meeting, it will make a huge difference to visibly show support for full-day K. Please make every effort to attend! 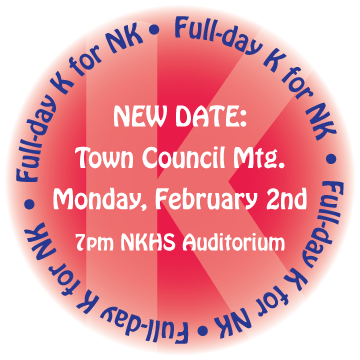 Whether you can attend or not, please click the following link to email the Town Council to state your support for full-day K: towncouncil@northkingstown.org. Full Day K for NK! ← Full Day K for NK!